The silhouette of Tallinn, the sandy beaches of the Katharina pier, Patarei sea fortress-prison or the unforgettable Estonian islands? You can enjoy all of the above under white sails with friends or colleagues! Value speed and glamour? From our fleet, lovers of luxury and trend can find the perfect motor yacht with exclusive leather furniture to invite their guest on and have a nice glass of champagne. While sailing with our yachts, we can guarantee You the best service and the best experience! We renew our fleet constantly and it is most definitely the best in Estonia! Safe sailing trips since 2002 – the trust and feedback of our clients is very important to us and we will always try to make our services more comfortable for everyone! 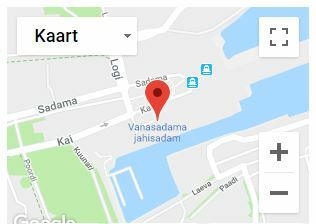 We are located in the best part of Tallinn – right in the city center, in Old City Marina. Our yachts stand in front of the KAI cafeteria and the cars can be parked right there.